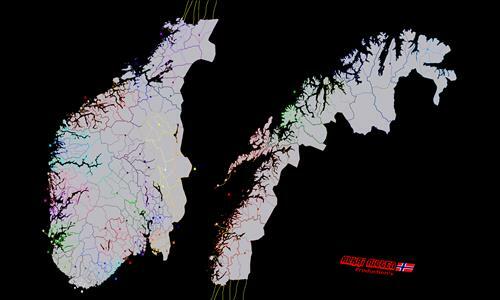 This is a Detailed map consisting of all the 428 municipalities(as of 2013) of The Beautiful country of Norway. This map is the first map ever i have created. I have spent a lot of time working on this. Most of the time was spent on failing, and learning how to use Incscape. I have plans on making a new map. There are a few flaws on the map, so i had to improvise on some territories and bonuses, since i didn't want to start all over. Review by Nathan on 1/3/2018. Great map! I really enjoyed playing on it. It has two flaws, neither of which is the maker's fault. First, Norway's coastline is insane. It's incredibly difficult to follow, but the maker does a fine job making the connections intuitive (or as intuitive as they can be, anyway). Second, this map gets very linear in the north. Again, so does Norway. I might suggest using a few coastal territories as ports that connect up and down the coast. For example Halden > Larvik > Farsund > Stavanger > Bergen > Solund > Selje > Smola > Fosnes > Traena > Rost > Lenvik > Hammerfest > Vardo. Suldal should connect to Vinje. Namsskogan should not connect to Bindal. Review by A_B3 on 1/7/2018. Difficult to win against the AI. A good play.